Fresh from the minds of talented product designers and MINI owners comes the "Go Badge" line of badge holders and dome badges. This is a fantastic product that can be installed on just about vehicle with a grill that has enough room for the velcro strap to fit through. Super easy to install and made of injection molded plastic, this holder is very durable and versatile. Once installed the badge holder will accept just about any standard 3" magnetic badge using this ingenious 2-piece ring system. However, the minds at Go Badges have also developed a very slick round domed plastic badge insert specific to the badge holder. Swap out the badges as often as you like. Badges are sold separately. Badge Holder available in Black or Chrome. Black badge holder blends in seamlessly with most black grills while the Chrome version will be a nice accent. WHAT IS A GO BADGE? A Go badge is an emblem that is mounted to a vehicle's grill to express a club affiliation or personal interest. They are fun to collect and can be easily changed for occasion or to fit your mood. ABOUT BADGES AND MOUNTING KIT The universal mounting kit is designed to install in minutes without tools. Badges can be purchased separately and easily updated for ongoing fun and expression. DOME BADGES Dome badges are printed on high quality 3" magnetic backed vinyl, with a high gloss weatherproof coating. Your first badge should be purchased with a mounting kit. Additional badges can be purchased separately. 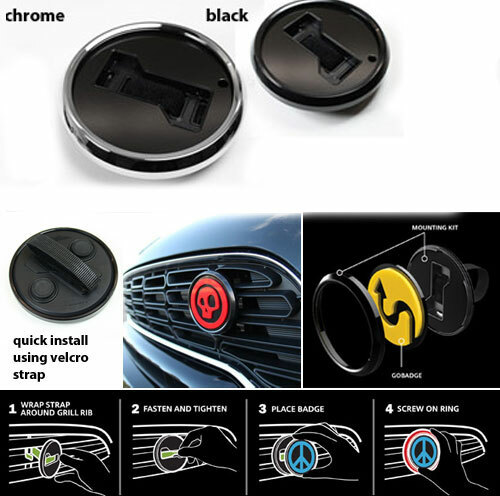 SAFE AND SECURE Each badge is magnetically positioned in mounting kit and securely trapped by exterior trim ring. Q. Will Go Badges work with other grill badge holders? A. Dome badges will magnetically mount to other badge holders that are metal and have a 3" diameter. Go badges does NOT recommend mounting their 3D badges to other mounts due to their additional weight. The Go Badge mounting system includes a security ring to ensure badges are not lost. Q. Will my badges from other manufactures work with Go Badges mounting kit? A. Yes, the mounting kit is designed to fit other company's badges as well as the Go Badge dome badges and 3d badges. Q. I have the dual badge holder for the license plate from another manufacture. Will your mounting kit fit? A. Yes, you can attach our mounting kit to the license plate badge holder with a screw. Our mounting kit has a center hole which will allow you fasten together. Q. Can Go Badges go through a car wash? A. Yes. Go Badges are firmly mounted via the security ring so they will not fall off like other badge holder systems. Q. Do I Need a mounting kit? A. Yes and No. Dome badges can be placed on any metal surface of your car or truck. Be creative! If you want to mount to your grill then our mounting kit is needed. However, we do not recommend placing 3D badges without our mounting kit due to their additional weight. Q. Will my Go Badges mounting kit stay secure on my grill? A. This system has tested in many conditions with great success. However, as cars do experience many harsh weather and temperature conditions it is recommend to periodically check to make sure your Go Badge is still as firmly mounted as when you first place it on your grill. If for some reason it feels a little loose, simply remove the security ring, remove your badge and tighten down on the mounting strap. Q. Can I mount my Go Badge system places other than my car grill? A. Yes. Go Badges simple mounting system make it possible to mount on roof racks, bikes, motorcycles, boats etc. Be creative. Q. Can my Go Badges mounting system be positioned easily? A. One of the unique qualities of Go Badges is experimenting with where on your grill they look their best. You can move them around or add more then one for fun. Q. How do I clean my Go Badge? A. Both the dome badges and 3D laser cut acrylic badges are dishwasher safe. Simply place in silverware basket and run on gentle. For a quicker clean, a soft cloth and a mild soap and water will clean up your dome badges very well.